Look through the bridge and you will see a spooky sight awaiting thee. That is beautiful! I opened it cautiously though.. thinking that you might be puttin something scurry up- and not adorably sweet. Cuz i'm a scurdy cat and i'm always on the lookout for scurry things. 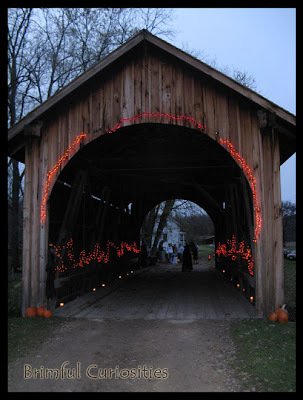 Love covered bridges, but not spooky witches! Neat pic. That is spooky and so cool at the same time! That is a pretty covered bridge, even if its scary. That is a cool bridge! This looks like something right out of The Bridges of Madison County. Ahhh reminds me of the headless horseman tale. Beautiful bridges. Now that is so totally awesome I can't even tell you! I told Kurt we NEED to do Stonefield next year!!! !